The Ministry of Health today warned members of the public against heeding malicious SMS rumours about short in supply of medicines and blood in hospitals to treat patients or outbreak of certain diseases, reported the official news agency WAM. Dr. Amin Al Amiri, Executive Director at MoH for Medical Practices and Licensing Affairs, said recently circulated text messages propagated rumours that there were lack of blood units and appealed to people to donate blood of specific group for a hospitalised patient. ”These circulated messages are baseless and have no sources,”he emphasised. 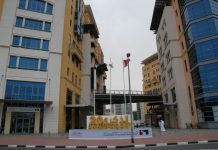 He added that the Department of Blood Transfusion and Research in Sharjah, the main blood agency in the country, had approached all hospitals and other health authorities and facilities in the country and found that no patient was in need of blood. ”These messages aim at spreading panic and confusion among members of the public and portraying false situation in regard to the reality of health services in the country,”he indicated. He urged those receiving these messages to contact the health authorities to verify their accuracy. ”Recipients of these messages are urged to communicate with the health authorities before they forward them to other persons,”he added.